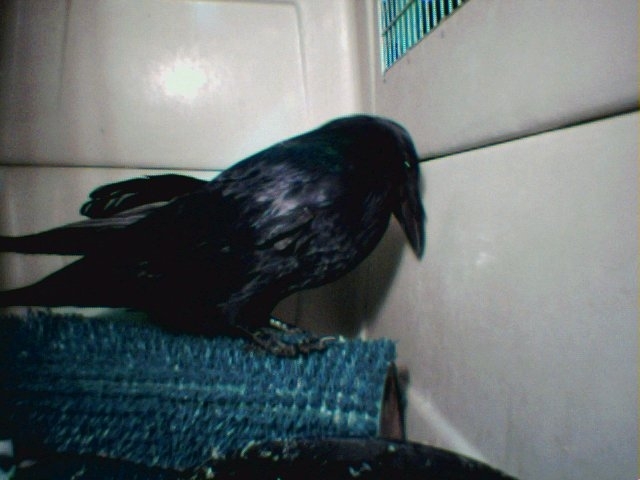 The Common Raven is one of my favorite birds. It's a beautiful bird with all black feathers. A scavenging omnivore and it's found in nearly every habitat throughout Alaska. They are large, intelligent birds usually found together with others of their kind. They often congregate near human settlements during non-breeding times. They can be minor nuisances by scattering unattended garbage and stealing food set out for dogs. They will come to baited traps, which is unfortunate for trapper and bird alike. They're related to the crow and magpie. The one pictured above had a wing injury. Don't know how he got it, he was found hoping around. He probably got it trying to do something he shouldn't have, obviously. They are sneaky birds and excellent escape artist. A lot of people don't care for them because they're scavengers. Somebody has to clean up. They do eat live prey also. Mostly small animals or rodents. There have been stories of them taking a reindeer or elk. The raven has often played important roles in cultures, mythologies, and writings. Ravens disobeyed Noah during the great flood by failing to return to the ark after being sent to search for land. The raven was used as an emblem by raiding Viking warriors in Europe, and has been written-up in countless disparaging ways in western literature. In Norse mythology, the god Odin used two ravens named Thought and Memory, to fly the world each day in order to inform him of what was happening. The good news. The Migratory Bird Treaty between the United States, Canada and Mexico was amended in 1972 to include the Corvids, thus giving federal protection to these species. Leave them alone if you like them or not. Do as I do. I watch them and get a good giggle. The other good news is that the fellow pictured above was released back to live with mother nature. Here's hoping he learned his lesson and stays away from what brought him to us in the first place.